Explorer Inflatable Kayaks™Expedition Rated, Whitewater Ready! Sea Eagle Explorer Kayaks are great wet or dry boats - they are tough enough for class four whitewater, but stable, dry and comfortable on flat-water as well. Now with 16 super-fast self-bailing drain valves that can be left open for wet whitewater and ocean kayaking or closed for high and dry flat-water paddling. The Explorers also feature a removable slide skeg for improved tracking on open water. Pound for pound these new Explorers are champions capable of handling any type of adventure! FastTrack™ Inflatable KayaksStable, Fast & True Tracking! Sea Eagle FastTrack™ Kayaks are sleeker and faster and than ever before! 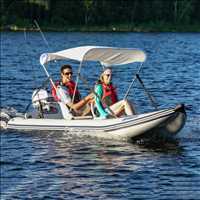 The FastTrack's™ combination of sleek, curved, touring shape with state of the art "NeedleKnife Keel" provides true rigid kayak performance with the benefits of an inflatable. Most importantly, the FastTrack™ is designed to be extremely safe and stable. A great feature is the fact that Sea Eagle FastTrack™ kayaks weigh far less than most all-rigid kayaks. Rigid kayaks can weigh 65-70 lbs, our Sea Eagle FastTracks™ weigh just 35 & 44 lbs respectively. This makes handling our kayaks a dream by comparison. Best of all, because FastTracks™ are inflatable they can be packed into a bag that's a mere fraction of their size! RazorLite™ Inflatable KayaksSuper Sleek & Light - Incredibly Fast! 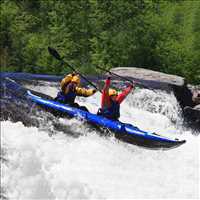 Inflatable Sport KayaksAmerica's Most Popular IKs! 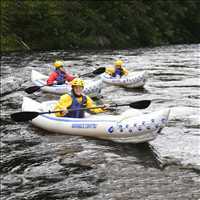 We began in 1968 selling an inflatable kayak very similar to our present Sea Eagle Sport Kayaks. Since then we have made many improvements in our inflatable kayaks. Today, we offer superior one way valves, thicker hull material and an even better material formulation for greater strength, reliability, and durability on the water. Sea Eagle Sport Kayaks pack to a fraction of their inflatable size, can be carried almost anywhere there is water and set up in less than 10 minutes! They are great fun for beginners and experienced paddlers alike. 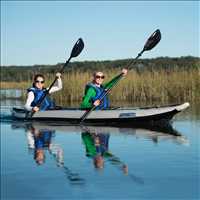 With a lightweight design and efficient hull shape, the Sport Kayaks are swift paddling boats and easy to handle for young or old alike. When you consider their cost verses the way they can be used, Sea Eagle Sport Kayaks truly represent one of the best values in boating today! 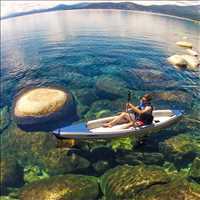 PaddleSki™ Inflatable Catamaran KayakVersatile Catamaran Kayak Does it All! The Sea Eagle Paddleski gives you two benefits you won't normally find in a kayak - Stability and Speed. Because of the wide hull, the PaddleSki is remarkably stable and comfortable. Because of the catamaran design, the PaddleSki cuts through the water with minimal resistance.